Dentist, Beenabahen(Beena) Harkhani, DMD, enjoys helping people look and feel better by providing them the oral health they need. She provides family dentistry services, cosmetic dentistry services and emergency dental services including exams, cleanings, fillings, extractions, wisdom teeth extractions, root canals, periodontal (gum) disease management, laser therapy, oral cancer screenings, veneers, and teeth whitening. She also provides restorative dental services such as crowns, bridges, dentures, bone grafting and dental implant restorations. Dr. Harkhani treats adults, teenagers and children. 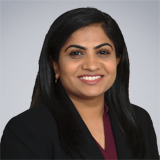 Dr. Harkhani earned her Bachelor of Dental Surgery degree at SDM College of Dental Sciences & Hospital in Karnataka, India and completed a post graduate fellowship program in Orofacial pain at Rutgers Dental School in New Jersey, where she also received her Doctor of Dental Medicine degree in 2016. She is fluent in English, Hindi, and Gujarati.